In its friendly and unassuming restaurant, Robinson Seafood Market in Cedar Key dishes out incredibly fresh and flavorful seafood dishes that are sure to tantalize the senses and please the palate. The crispy crab fritters and a cup of the rich and sumptuous chowder make sensational starter options. 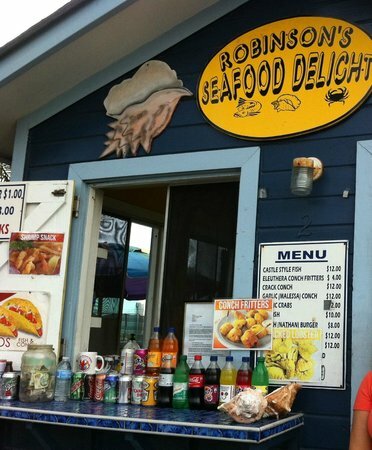 Some of Robinson Seafood Market's specialty entrée dishes include the steamed clam dinner, the shrimp dinner, the soft-shell crab and the grouper dinner, all of which come with satisfying sides like fries, baked beans, slaw and hush puppies. Handhelds, like the seafood hoagie and the chicken sandwich, are also popular with guests. Besides hamburgers and sandwiches, Robinson also has landlover special entrées, as well as a kids' menu, making it a great spot for the whole family. Besides being a sit-down restaurant, Robinson Seafood Market also sells seafood related items so you can prepared an incredible meal at home.